A cult figure in Japan, Saburo Teshigawara began his career in Tokyo in 1981 after studying the unusual combination of plastic arts and classical ballet. In 1985 he formed his own company, KARAS, with Kei Miyata and started creating group choreographies alongside other visual art works. With KARAS he has performed in major cities all over the world and has been commissioned by many international ballet companies (Frankfurt Ballet, Paris Opera, Nederland Dans Theater). Read on for a fantastic Japan Centre competition to win tickets to see this new performance. 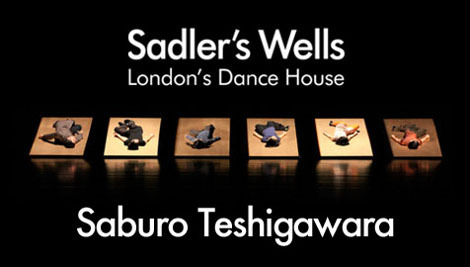 Teshigawara returns to Sadler’s Wells with his company’s newest work, Mirror and Music. Danced by a cast of eight, with a fascinating solo performed by Teshigawara himself, Mirror and Music explores the simultaneously tangible and intangible nature of music and the reflection we see when we look into the mirror. Characteristically, this production features choreography, set, costume and truly stunning lighting design all by Teshigawara. This is a chance to see a modern-day master of stage beauty at work. This is indeed your chance to see this modern day master… and for free by entering our Japan Centre competition! Simply visit our Facebook page and leave a comment, and you will automatically be entered into our competition to win a pair of tickets to see this great event. We will choose a random winner on Friday evening from the everyone who has commented. Yes, it’s really that simple, check our Facebook page, become a fan if you aren’t already and just leave a comment to the Facebook post about this competition. Please make sure that you are available on the evening of the 15th June for the performance. You will be notified through your facebook account if you have been selected as the winner so please make sure to check your facebook account over the weekend to see if you have won. The tickets will be left at the box office collection desk with your name for you to collect before the performance starts. Keep checking Japan Centre for more competitions coming soon!